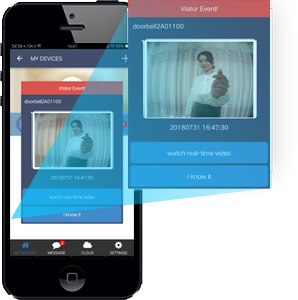 Whether it is the doorbell ringing, the human body passing or staying, the security door opening, the timing monitoring, and the phone actively connects the doorbell for monitoring. Once the alarm is triggered, the device will immediately send the live picture to your phone. The fastest, you will receive images within 4 seconds. After receiving the alarm notification, click "watch real-time video" immediately. Even if you are thousands of miles away, you can know what is happening in your home. 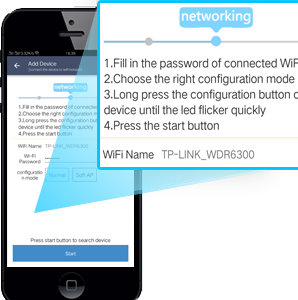 The connection between VigekSmart application and your device is intelligent one-key configuration mode, simple and fast. Press and hold the button on the back of the device for a while, until the red indicator flashes quickly and the device enters config mode. Select the home network on the APP, click Start, wait 10-20 seconds to complete the configuration automatically. 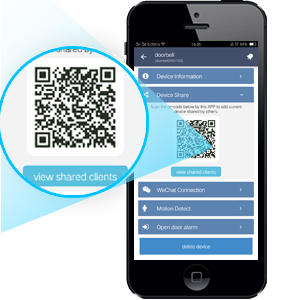 You can share your device to others easily that just let him scan a qr-code. Then you don't have to worry about missing an alarm. You and your family can work together to maintain the family's safety.